Really on the air this morning, and now on YouTube, talking about “quite the event” as Chris Beckham called it, South Georgia Growing Local, this Saturday, January 24th at Pine Grove Middle School, in Lowndes County, Georgia. Five times five: five tracks in five sessions, from soil to planting to cooking and nutrition, including aquaponics by UGA Professor Pat Duncan and local oils by national award winner Clay Oliver. Space still available; sign up now! Video by Gretchen Quarterman for Okra Paradise Farms (OPF). This entry was posted in Agriculture, Economy, Gardening, SOGALO15 and tagged 24 January 2015, Agriculture, Chris Beckham, Economy, Gardening, Georgia, Gretchen Quarterman, John S. Quarterman, Lowndes County, Okra Paradise Farms, OPF, Pine Grove Middle School, radio, SOGALO15, South Georgia Growing Local 2015 on January 21, 2015 by John S. Quarterman. 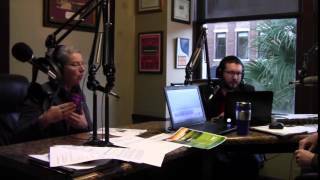 See her on YouTube if you missed her on the radio Monday, talking about South Georgia Growing Local, this Saturday, January 24th at Pine Grove Middle School, in Lowndes County, Georgia. Includes a back yard garden story about her daughter Lindsey, where the apartment manager was very impressed. This entry was posted in Agriculture, Gardening, SOGALO15 and tagged 24 January 2015, Agriculture, Gardening, Georgia, Gretchen Quarterman, John S. Quarterman, Lowndes County, Okra Paradise Farms, OPF, Pine Grove Middle School, radio, Scott James, SOGALO15, South Georgia Growing Local 2015 on January 21, 2015 by John S. Quarterman. South Georgia Growing Local is also for North Florida, where these goats live. Bobbie’s business is Golden Acres Ranch, between Monticello Florida, and Thomasville, Georgia. Come hear Bobbie talk about her goats at South Georgia Growing Local 2015, this Saturday, January 24th, at Pine Grove Middle School, in Lowndes County, Georgia. This entry was posted in Agriculture, Economy, Gardening, SOGALO15 and tagged 24 January 2015, Agriculture, Bobbie Golden, Economy, Florida, Gardening, Georgia, Goats, Gretchen Quarterman, John S. Quarterman, Lowndes County, Okra Paradise Farms, OPF, Pine Grove Middle School, SOGALO15, South Georgia Growing Local 2015 on January 21, 2015 by John S. Quarterman. A talk instead of tours of the Pine Grove Middle School greenhouses this year. The greenhouses have a fungus just now because it is too moist in them because of the amount of water they had to put on during the freezes. Therefore there will be no tours this year. However Jeff and Tony will be happy to give a talk. 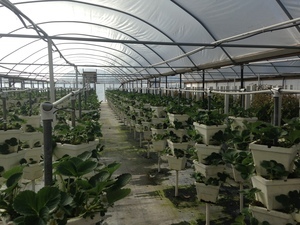 This entry was posted in Agriculture, Gardening, SOGALO15 and tagged 24 January 2015, Agriculture, Gardening, Georgia, greenhouse, Gretchen Quarterman, hydroponic, Jeff Morgan, Lowndes County, Okra Paradise Farms, OPF, Pine Grove Middle School, SOGALO15, South Georgia Growing Local 2015, Tony Mallory on January 20, 2015 by Gretchen Quarterman. Update 2015-01-20: Oops; actually Wednesday January 21st on the Chris Beckham show, still 8AM. Listen in tomorrow! Morning radio is where a lot of people get their local news, and Gretchen will be talking about South Georgia Growing Local on both the local talk shows this week, reminding everybody about the great lineup of speakers about local agriculture for Saturday January 24th at Pine Grove Middle School. You can listen to them with a radio, or through various online streaming services, such as tunein. This entry was posted in Agriculture, Gardening, SOGALO15 and tagged 105.9 FM, 24 January 2015, 92.1 FM, Agriculture, Chris Beckham, Gardening, Georgia, Gretchen Quarterman, John S. Quarterman, Lowndes County, Okra Paradise Farms, OPF, Pine Grove Middle School, radio, Scott James, SOGALO15, South Georgia Growing Local 2015, WDDQ, WVGA on January 18, 2015 by John S. Quarterman. A speaker at the upcoming South Georgia Growing Local Conference just got a national award in San Francisco. A Georgia farmer took home a coveted Good Food Award in the oils category this week. Oliver Farm Pecan Oil was recognized Thursday at the Good Food Award ceremony in San Francisco. Since he started pressing food oils in 2012, Clay Oliver has expanded to produce cooking oils from sunflower, pecan and peanuts from the family homestead near Pitts, Ga. This entry was posted in Agriculture, Gardening, SOGALO15 and tagged 24 January 2015, Agriculture, Clay Oliver, Gardening, Georgia, Good Food Award, Gretchen Quarterman, John S. Quarterman, Lowndes County, Okra Paradise Farms, Oliver Farm Pecan Oil, OPF, Pine Grove Middle School, SOGALO15, South Georgia Growing Local 2015 on January 17, 2015 by John S. Quarterman. Now a word from our founder. Science is finding that a healthy gut biome is vital to a powerful immune system, a highly functional brain, and overall good health. Jump-start your road to recovery or maintain your vigor by incorporating cultured foods in your diet. Fermenting is wicked simple and lots of fun. In this workshop Janisse will make sauerkraut, kefir, and kombucha. She’ll also talk about many other homemade cultured foods you can incorporate into your homestead or home kitchen for the benefit of you and your family, including cream fraiche, vinegar, and much more. Janisse Ray and Leeanne Culbreath started the South Georgia Growing Local series of conferences in November 2010 in Tifton. For more about Janisse Ray see her web page. 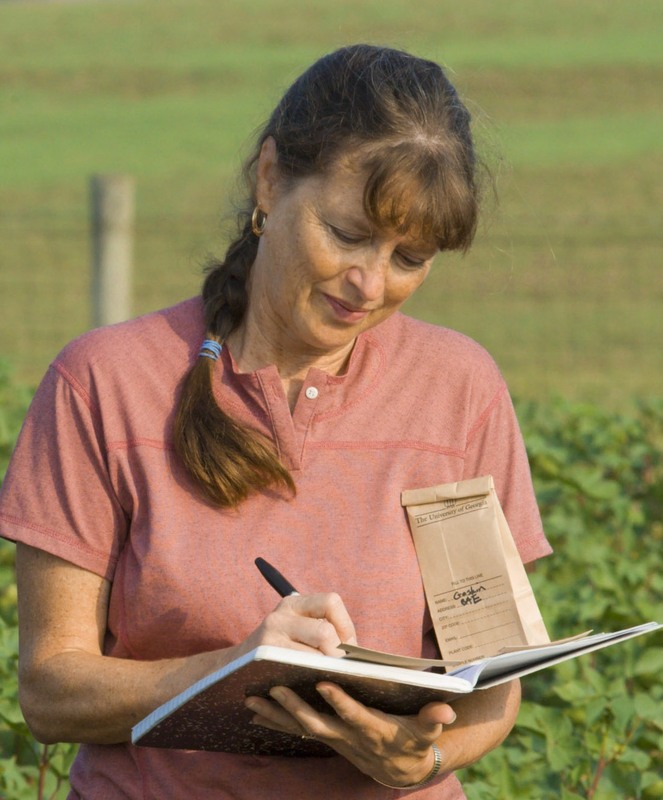 She already held Southeast Georgia Growing Local in Tattnall County in November 2014. Come see Janisse at the other fifth conference in this series, South Georgia Growing Local 2015, January 24, 2015, at Pine Grove Middle School in Lowndes County north of Valdosta. This entry was posted in Agriculture, Gardening, SOGALO15 and tagged 24 January 2015, Agriculture, brain, cream fraiche, Fermentation, Gardening, Georgia, Gretchen Quarterman, gut biome, Health, Janisse Ray, John S. Quarterman, kefir, kombucha, Lowndes County, Okra Paradise Farms, OPF, Pine Grove Middle School, sauerkraut, SOGALO15, South Georgia Growing Local 2015, vinegar on January 15, 2015 by John S. Quarterman. 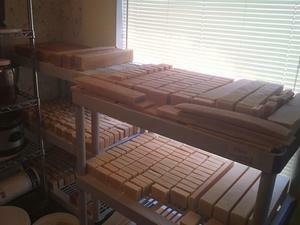 What’s in your soap? Listen to Tom Kuettner and find out. Why use Natural soap, Types of soap making, Basic soap making, What problems do adding Milk, Essential Oils, Botanicals pose, how do we deal with these problems to make quality soap. This entry was posted in Agriculture, Gardening, SOGALO15 and tagged 24 January 2015, Agriculture, Gardening, Georgia, Gretchen Quarterman, John S. Quarterman, Lowndes County, Okra Paradise Farms, OPF, Pine Grove Middle School, Soap, SOGALO15, South Georgia Growing Local 2015, Tom Kuettner on January 14, 2015 by John S. Quarterman. Here’s the current draft schedule for the conference, with all five tracks. Bees, bugs, and oils; plants, planting, and soils! Herbs, small fruits, and citrus; cooking, fermenting, and curing! Goats, fish, and chickens; water, solar, and weaving! Nutrition, seed saving, and permaculture! The current updated schedule will always be in the main conference page. 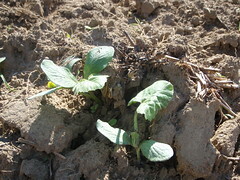 This entry was posted in Agriculture, Gardening, SOGALO15 and tagged 24 January 2015, Agriculture, Gardening, Georgia, Gretchen Quarterman, John S. Quarterman, Lowndes County, Okra Paradise Farms, OPF, Pine Grove Middle School, schedule, SOGALO15, South Georgia Growing Local 2015 on January 13, 2015 by Gretchen Quarterman. Crops need soils with organic matter, as a UGA soil specialist reminds us. Healthy soils are fundamental to growing crops sustainably. The key to heathy soils is organic matter because organic matter is so important for microorganisms and the other soil creatures. Most of our agricultural soil have very low soil organic matter from years of farming. It can be a challenge to increase organic matter in South Georgia with its sandy soils and hot, humid climate, but it can be done. Come learn basic principles of soil management and strategies for you to improve your soil health. This entry was posted in Agriculture, Gardening, SOGALO15 and tagged 24 January 2015, Agriculture, Gardening, Georgia, Gretchen Quarterman, John S. Quarterman, Julia Gaskin, Lowndes County, Okra Paradise Farms, OPF, Pine Grove Middle School, SOGALO15, soil, South Georgia Growing Local 2015 on January 13, 2015 by John S. Quarterman.